Under the current and pledged policies, the world will exhaust its energy-related CO2 emission budget in less than 20 years. Though, 167 GW of renewable power infrastructure was added in 2017, about six-fold increase in renewable energy adoption is required to keep global warming below 2°C, says International Renewable Energy Agency’s (IRENA) report launched at the Berlin Transition Dialogue on Tuesday. Speaking at the event, Adnan Z Amin, director general of IRENA says that in all probability, share of renewable in energy mix across all countries will exceed 40 per cent, and in few countries the share will even go up to 60 per cent by 2050. 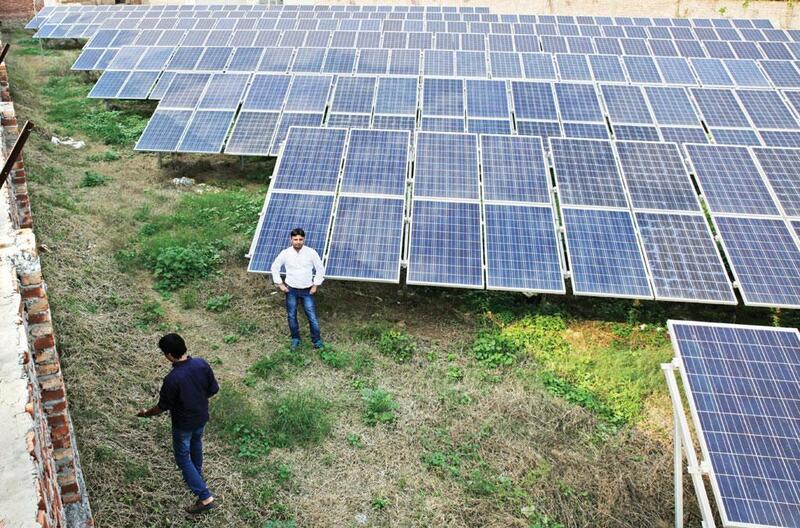 In 2017, according to the report titled ‘Global Energy Transformation: A Roadmap to 2050’, the renewable sector added 167 GW of energy capacity globally, a growth of 8.3 per cent over the previous year and a continuation of previous growth rates since 2010, averaging 8 to 9 per cent per year. And at the same time, the cost of solar PV and wind continue to fall. Auction results and continued technical innovations suggest that costs will fall further in the future, the report said, adding that solar PV costs are expected to halve again by 2020 (as compared to 2015-16). The report highlights that under the current and pledged policies, the world will exhaust its energy-related CO2 emission budget in less than 20 years despite continued strong growth in renewable capacity additions. By the end of 2017, global renewable generation capacity reached 2,179 GW worldwide. Accelerating the speed of global renewable energy adoption by at least a factor of six–critical to meeting energy-related emission reduction needs of the Paris Climate Agreement—can limit global temperature rise to 2°C, the report says. 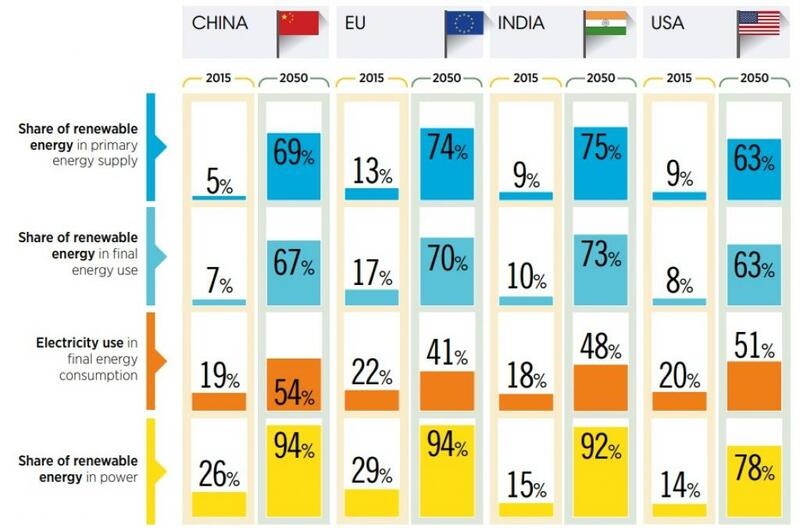 According to it, without further increasing the deployment of renewable infrastructure, fossil fuels such as oil, natural gas and coal would continue to dominate global energy mix by 2050. This acceleration of renewable energy will have an impact on other areas, too. For example, by 2050, the global economy would grow by one per cent and global welfare such as health benefits from reduced air pollution and reduced climate impacts would improve by 15 per cent, compared to the current trajectory, says the report. 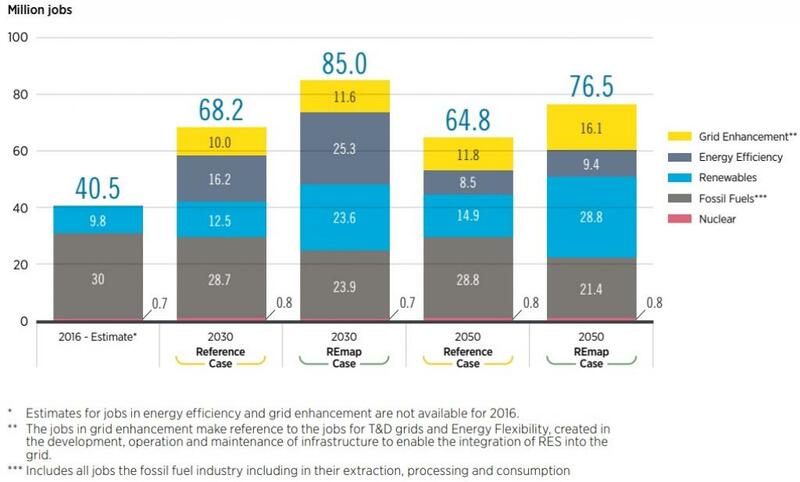 The report also finds that increasing cumulative energy system investment by 30 per cent by 2050 in favour of renewable energy and energy efficiency can create over 11 million additional jobs in energy sector, completely offsetting job losses in fossil fuel industry. “Renewable energy and energy efficiency together form the cornerstone of the world’s solution to energy-related CO2 emissions, and can provide over 90 per cent of the energy-related CO2 emission reductions required to keep global temperature rise to two degrees Celsius,” says Amin. “If we are to decarbonise global energy fast enough to avoid the most severe impacts of climate change, renewables must account for at least two-thirds of total energy by 2050,” he concludes.